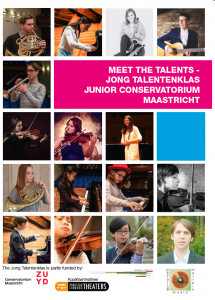 The Jong Talentenklas of the Junior Conservatorium Maastricht provides a podium and a social environment for young talented musicians in the Limburg region. The Young Conservatorium aims to have an international, border-crossing character, in line with the geography of the Limburg region. The international character also shines through in the diverse origins of the participating students. The students give concerts throughout Limburg, the Netherlands, Belgium and beyond. Individually, the students have demonstrated their excellence in performance by participating in and winning musical competitions throughout the Netherlands and even Europe. Students have followed masterclasses with nationally and internationally renowned musicians. The group is a diverse and non-homogenous group of young musicians. The students play a variety of musical instruments such as piano, violin, viola, trumpet, saxophone, fl ute, horn and guitar. The group structure provides opportunities to make music together, accompany each other and play chamber music. Each student follows his or her own educational trajectory, guided by mentors and teachers. In addition to individual lessons, Saturday classes are intended to strengthen theoretical music skills and provide students with a chance to give and receive feedback on each other’s musical progress. In 2016, students of the Jong Talentenklas travelled to Leipzig to give concerts at venues such as the Schumann, Bach and Mendelssohn Haus. For several years students have participated in a Spanish exchange program (Mentoring Music Matters! ), attending master classes and giving concerts in Spain. They perform in beautiful concert halls in the region Limburg such as Parkstad Limburg Theaters, the Kopermolen in Vaals, the Kloosterbibliotheek in Wittem, and at the Conservatorium Maastricht during the Night of Classical Music. Once a year they give a Presentation Concert, and a Final Concert. The Jong Talentenklas was started in 2010 by Alejandro Serena Llinares and Rik Bastiaens. The goal of this new initiative was to take talented piano students to a next level of musicianship. Over the last three years, the class has expanded to include young musicians playing all possible instruments, with the aim of gaining a reputation of excellence within the Netherlands and in Europe. Music teachers help these young musicians to build a professional career in music. Our tools are: practical and theoretical education, giving and attending concerts, attention, patience and… a love of music! 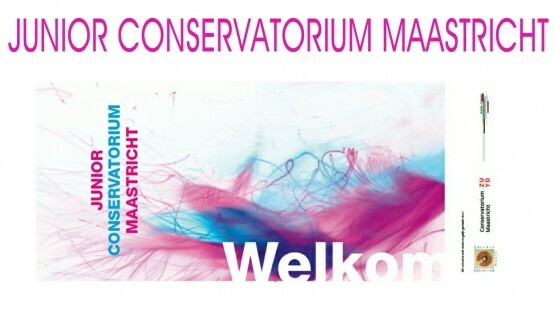 Every Saturday at 09:15 AM an enthusiastic group of young students gathers at the Conservatorium in Maastricht. They receive coaching from an amazing team of professional teachers. They work on music interpretation, stage presentation, chamber music and its social aspects, theory, instrument technique, preparation of concerts and competitions and especially on understanding music in its social and historical context. We have noticed that this method of working has led to many highlights and beautiful moments. Something more precious than classical music is hardly conceivable; it is a friend for life. Working on this from early childhood, during school years, and on to fi nally performing on stage is a way of life. Music provides these young artists with essential skills on a social, mental, emotional and cognitive level. Music can teach history, people skills, feelings, compositional structure and multi-tasking. This way of working with music is hard work! Even if you are talented, you need musicality and a strong motivation to spend many hours on music, with and without your instrument. Good teachers and guest lecturers are indispensable for this transfer of knowledge, passion and motivation.